A homicide investigation is underway in Memphis following an incident in which a teen was stabbed to death while fighting another girl around her age this week. 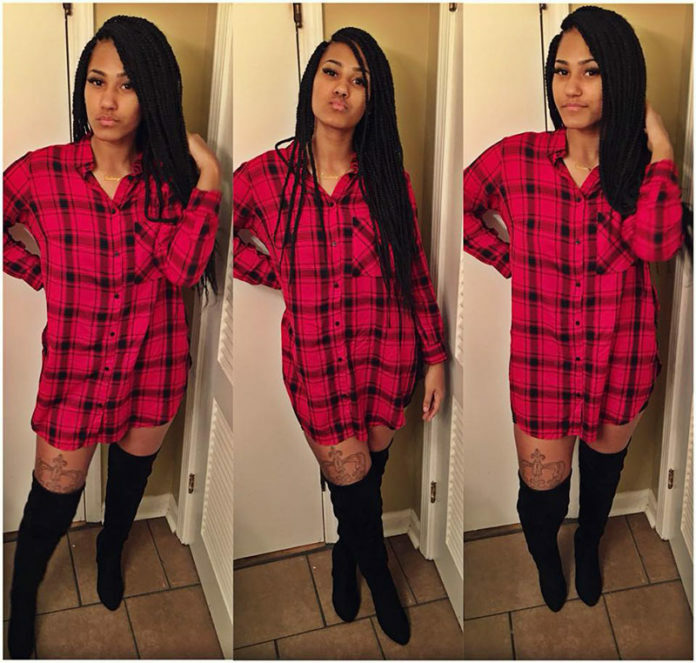 18-year-old Britney Algood lost her life late Thursday (Jul. 5) after getting into a fight with another woman later identified on social media as Bianca Sims. Cell phone footage showing the fight and the stabbing went viral on social media. 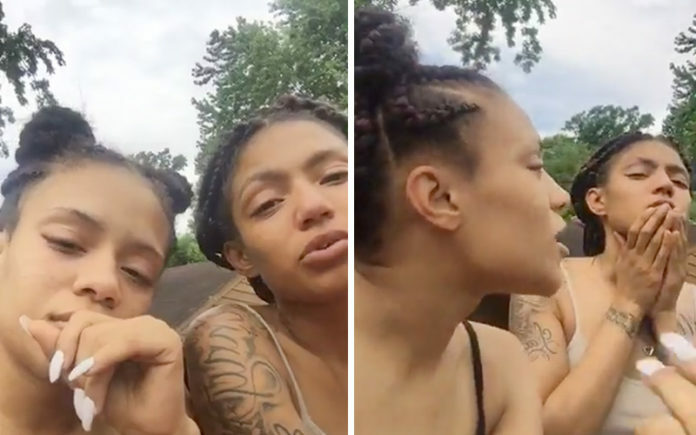 According to WSOC-TV, police were called to the scene of what they described as a “neighborhood fight” Friday, and when they arrived, they found two women, who witnesses said knew each other, fighting. “Once she pulled off, the victim was bleeding heavily,” one witness told Fox 13 Memphis. Britney Algood, a recent high school graduate, was taken to St. Francis Hospital, where she later died from her injuries. Bianca Sims, the woman responsible for the stabbing, remained on the scene and was later detained by officers, but wasn’t charged. According to MPD, this is an “ongoing investigation” as they determine whether the homicide was justifiable. 1Britney Algood was fighting a girl named Bianca Sims when she was fatally stabbed. The fight was apparently related to an ongoing “beef” over a boy Britney’s friend was dating. Memphis police said two young women got into a fight near the intersection of Knight Arnold and Ridgeway around 6 p.m. Thursday evening (Jul. 5) The fight happened between two females who knew each other, police said. Those two women were 18-year-old Britney Algood and a woman later identified on social media as Bianca Sims. At one point during the fight, Bianca pulled out a knife and stabbed Britney. Britney was taken to St. Francis Hospital by private vehicle and later died as a result of her injuries. Bianca remained on the scene and was detained by officers, but she wasn’t charged with anything. According to one woman on Facebook, the fight was the result of an ongoing beef over the past year between Bianca and a friend of Britney’s over a boy. 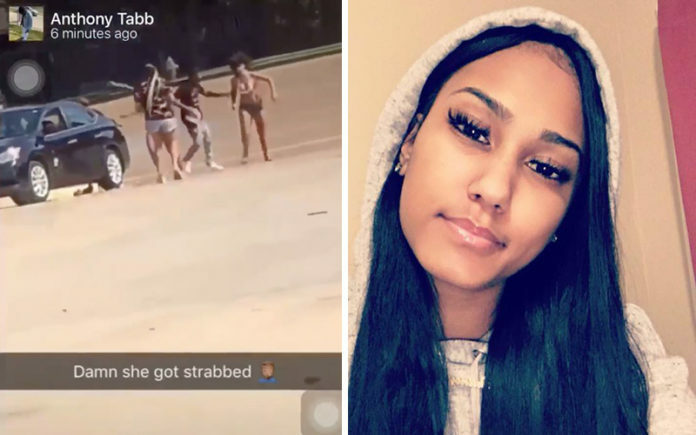 2Cell phone video footage showing the moment Britney Algood was stabbed went viral on social media. Video footage showing the fight and the moment Britney was stabbed by Bianca was shared on social media, where it quickly went viral. The viral cell phone footage also showed a baby being taken from a car near the chaos at one point. In one clip, a woman can be heard saying “don’t shoot!” insinuating that someone had pulled out a gun. “She cut the sh** out of her,” says another man off-camera. “With the big knife?” the woman asks. “Yeah,” the man replies. Another eyewitness, who didn’t want to be named, said he was leaving work when he saw the fight. He said he saw one of the women pull out a knife and stab the other. The stabbing victim (Britney Algood) could be seen in the video footage running from the scene. “Once she pulled off, the victim was bleeding heavily,” the anonymous witness told Fox 13 Memphis. “It’s like they were trying to jump the young lady, the victim,” the eyewitness said, adding that many other spectators were also recording the incident with their cell phones. “One girl had her camera out and was hitting the girl at the same time her friend was dying,” he said. 3Someone who was with Britney Algood allegedly pulled out a gun during the fight, and Bianca Sims is claiming she stabbed Britney out of self-defense because her baby was in the car. Friends of Bianca’s, some of whom were present during the altercation, say that she stabbed Britney out of self-defense because a man who was with Britney pulled out a gun and pointed it at the back of Bianca’s car, where her baby was sitting. Kash Key also answered the question as to why Bianca had a knife in the car to begin with, and she also cleared up some discrepancies with the stories, most notably the fact that local media outlets are saying that Britney was stabbed in the head, which Kash Key said isn’t true. 4Britney’s cousins say the gun was pulled out AFTER Britney was stabbed and they’re questioning Bianca’s claim that she was driving her baby to the ER at the time of the incident. After the incident, Britney’s cousins went on Facebook Live and explained their side of the story. They said that the story from Bianca’s people saying that a gun was pulled out at the beginning of the fight was not true. According to Britney’s cousins, the gun was pulled out AFTER Britney was stabbed. Britney’s cousins also questioned Bianca’s claim that she was driving her baby to the Emergency Room at the time of the incident. “She [Bianca] claims she was taking her baby to the emergency room for some odd reason. But, why you at a gas station? Oh, ’cause they was following you. Why would you pull up at the gas station, b**ch go to the emergency room, the f*** is you pulling up at the gas station for. I wanna know the real story, that’s all I wanna know. “It’s too many stories. First of all, y’all said she was going to the Emergency Room. But, on the post, how the f*** was she going to the Emergency Room when she was supposed to ‘meet up’ with Britney. But, next thing you know, I hear Britney was supposed to be waiting on Rossia at the pool. So what the f*** really going on.